Breaking into Upwork, can seem tough at the start. There are hundreds of established freelancers from around the world and you’re all competing for the same job. So the question is: How to get more jobs on Upwork and beat the competition? Today’s post is designed to help you stand out, attract clients and make it easier for you to get jobs (and make money). Before we get into the specifics of how to get more jobs on Upwork, I want to make sure you know the number one secret to finding work. What is it? It’s offering clients a skill that is valuable! Yep. The world of freelancing has evolved a LOT in the last decade. Freelancers are no longer just odd-job doers. Clients look to bring in a freelancer when they need specialised knowledge or skills for their project. And, as technology continues to overtake our lives, clients are also looking for ways to incorporate this into their businesses. Enter the skilled freelancer. As someone who specialises in an ‘”in-demand” skill, you can fill this gap and provide clients with the expertise they need. When asked for advice on how to get more jobs on Upwork, the first thing we usually tell people is to put work into their profile. Needless to say, a good quality profile is very important on Upwork. If you already have a profile, go back and make sure that it is 100% complete. Fill out as many sections as you can, in detail. 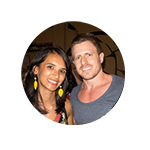 Make sure you have a professional profile photo of yourself and not a pet or abstract objects. Be specific in describing your skills. Add a portfolio if possible. I know I know, taking those Upwork tests can seem very annoying. Truth is, if you want to get work on Upwork, taking those tests is a necessary evil. One very important test that is a MUST is the Upwork Readiness test. Most clients will not give your profile a second thought if you haven’t done this test. Once you’re done with the Upwork Readiness test, take a couple of other ones that cover the skill sets you are hoping to work with. Generally a test will take about 20 minutes. Tests will help show just how good you are at something, so it’s worth taking them. Once you’re done done, ensure that you set the results to show up on your profile (especially if you did well on the test). 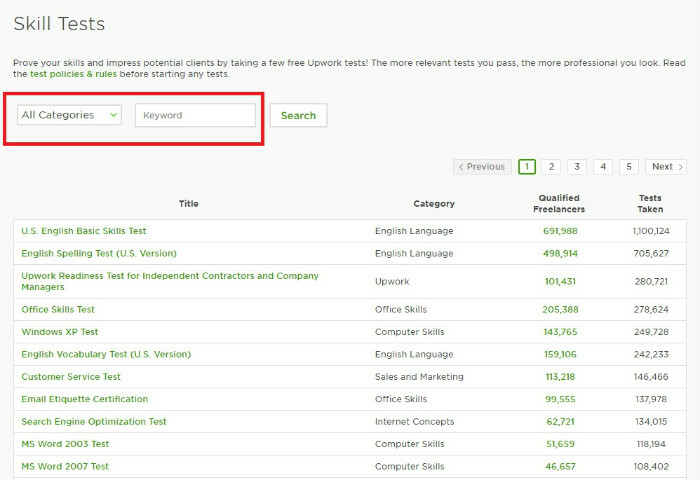 Completing tests on Upwork will raise your profile up the Upwork search engine much faster. To take a test, go to the ‘Tests’ section and search for tests that are relevant to your field under ‘categories’ or ‘keyword’. Reputation is everything on Upwork. 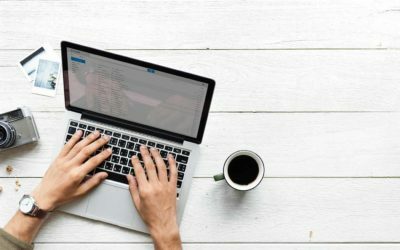 You can create your reputation in various ways on Upwork; such as quick responses to job invitations, communication with clients, job satisfaction and so on. The better your reputation on Upwork, the more jobs you’ll manage to get (and the more successful you’ll be). 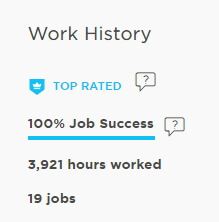 Upwork uses the Job Success score to measure your reputation. Put simply, if a client is happy with your work, you will have a high job success percentage (score). Your Job Success score also affects how you rank in the Upwork search engine. The higher your score, the higher the chances of getting a Top Rated badge. Learn how your Upwork job success score is calculated. 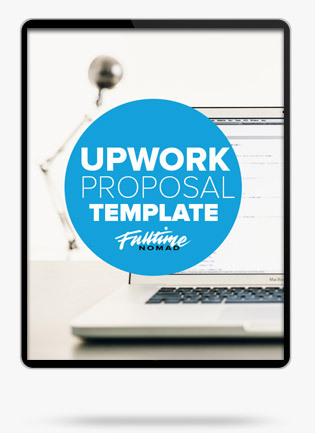 A well-written proposal is a huge part of bagging a contract on Upwork. Many freelancers, especially those who are just starting out, tend to pay very little attention to their proposals. Don’t be one of them. Don’t use a stock response. Make sure you send a new and customised proposal for every job. Be specific in why you are interested in the particular project and what experience or skills you have that will help you complete the project successfully. Provide samples of your past work that are related to a project you are bidding for. If there is anything that you don’t understand, don’t hesitate to ask questions about the project in your proposal. When starting out as a freelancer, it’s common practice to take up any job that has potential to earn you some money. However, as you progress and especially if you are interested in getting well-paying gigs that will earn you more, you will have to find a niche. 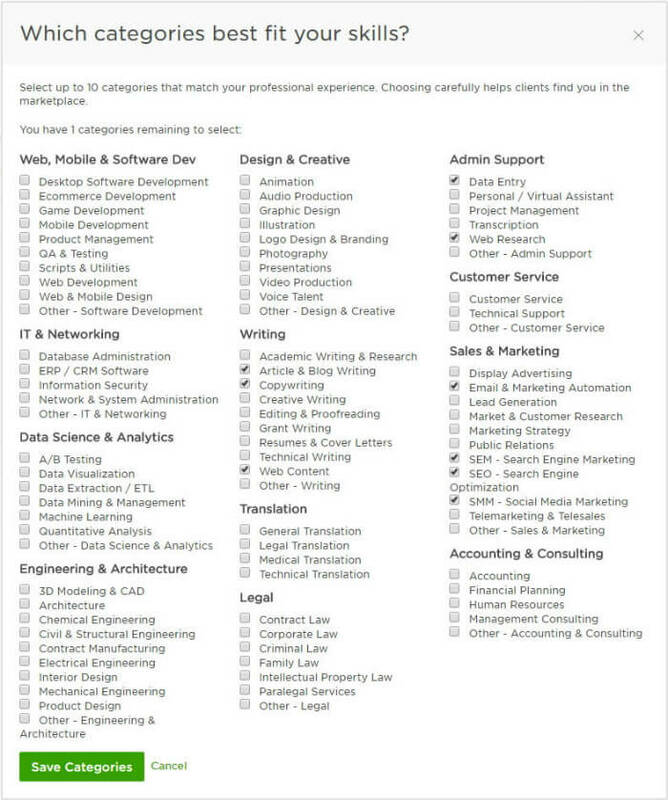 Choosing a niche increases your chances of getting a job because clients will see you as an expert in a particular field. 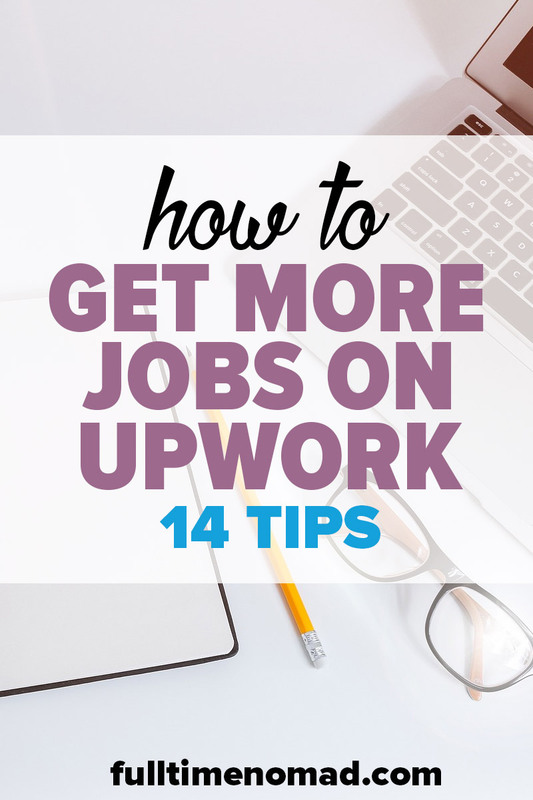 As you set up your Upwork profile focus on 1 or 2 skills that you feel you are best at. Once you’ve chosen a niche, build your profile around it. Make sure your job title contains keywords relevant to your niche. Add the keywords to your description, add portfolios of projects related to this niche and also take tests related to this niche. When applying for a job, don’t just apply to any job, be selective. To begin with, make sure that you search for relevant projects by setting up a job feed. This will make it easy to find a project within your skill set. 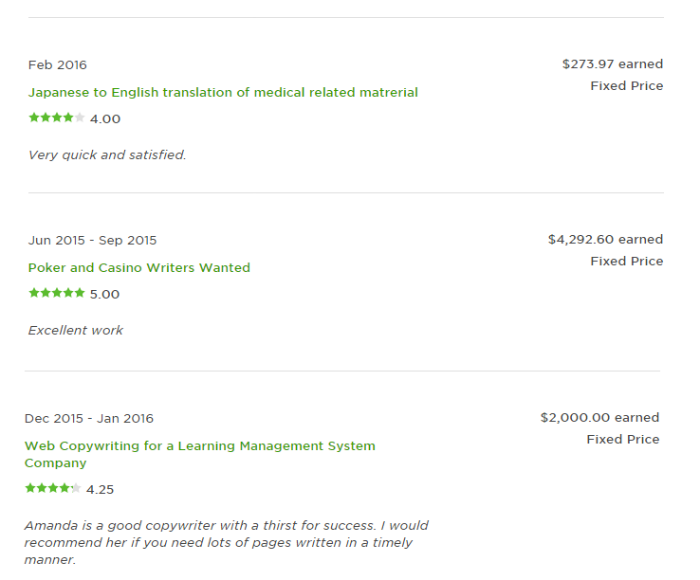 There are hundreds of jobs advertised on Upwork every day and finding the right one can be quite difficult. 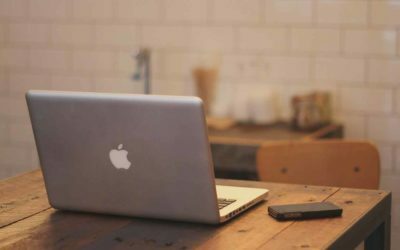 The Upwork Job Feed, lets you narrow down the job results into jobs that are more likely to fit your skills and from your preferred niche. The Job Feed is also important because it ensures you never miss out on new opportunities that match your skills. Enter one or two skills into the search bar to find projects that match your skills. Use filters on the left-hand side of the Search Results Page to set a targeted job feed. After setting your search preferences, add it to your Job Feed found on the left side of your homepage. Fixed priced jobs are jobs with a set scope to be delivered at a fixed price. With fixed price jobs, you can work as many or as few hours as needed to get the job done. Most of these projects are short term and payment is made after the project is completed. Fixed price jobs are good if you are starting out on Upwork and you need projects that you can work on and get paid fast. However, be careful because the client can dispute work done and end the project early without submitting your payment. Even though Upwork has introduced Escrow for fixed price projects, there is a certain amount of risk involved. 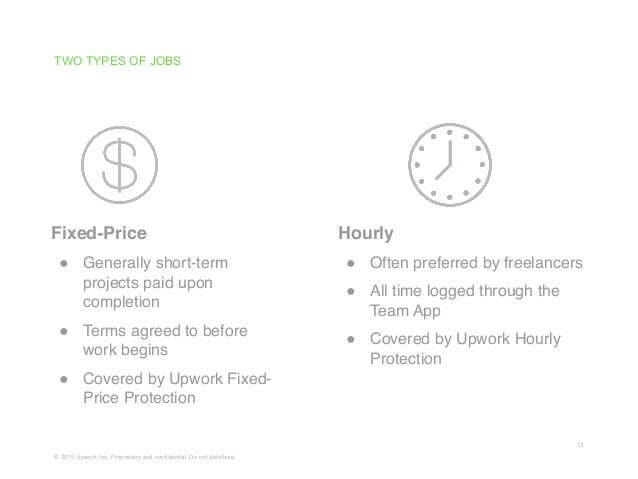 Hourly projects on Upwork are projects that are payable for every hour spent working on the project. Upwork’s time tracking app takes random screenshots of your computer every 10 minutes and uploads them to your work diary while you’re working. Payment for hourly work is guaranteed as long as the hours are logged using the time tracker and not manually. Upwork guarantees that as longs as you using their time tracker to do the job, you will get paid for the time. Deciding how much to charge for a project can be confusing because you do not want to undercharge nor overcharge a client. Before you set your rate, do a bit of research to find out the average pay for the type of jobs you are interested in. Take a look at what other similar freelancers are charging and use that as a guide. Once you have figured out the right rate make sure you stick to jobs that will pay you something close to that rate. As already noted, competition on Upwork is high so it is important that you bid for as many relevant jobs as possible to increase your chances of getting hired. However, you also need to be reasonable in the kind of jobs you bid for. Make sure that they will be worth your time, pay what you deserve and that you will be able to complete them within the set deadline. If you don’t have the time to work on a handful jobs, make sure you apply to only those that you will be able to handle. Before you start working on a project make sure that you fully understand what is expected of you and what the clients wants you to do. Always listen to your client’s concerns and respond positively and in a pleasant manner. Make sure that you deliver exactly what you promised. Ask the client to give you feedback on your work and should they request for changes, do so without complaining. Remember if you deliver what is expected of you, your clients will report good job satisfaction – which will increase your Upwork Job Success score. The beauty of freelancing is that you have the freedom to work whenever you want to. This can sometimes get out of hand if you don’t plan your time well. When taking up jobs be sure not to accept too much work that you have no time to complete. If you are working full time and freelancing on the side, make sure you have systems in place to balance your workload. Also, if your client is in a different time zone, be clear on exactly which time zone the deadlines are applicable to. Remember as a freelancer you are your own boss and you will be expected to follow through on what you’ve agreed to do so plan your time well to ensure that you have enough time to complete your projects in good time as agreed. Communication is key on Upwork. It is important that keep communication with clients open. Respond to messages as soon you possibly can, do not let days pass before responding. This will greatly affect your reputation. Creating a working relationship with clients is important if you want them to consider you for future or long term projects. By creating great relationships, you’ll build up your reputation making you successful. So to answer the question – how to get more jobs on Upwork? Experience is what you need. To ensure you are among the best freelancers on Upwork, work towards perfecting your skills. This will require you to keep learning about the jobs you’re interested in and how to best complete them. Take the time to continue learning about your niche. Want to Succeed on Upwork? There’s no better way to be successful on Upwork than by learning from the experts. Why don’t you try out these recommended courses? 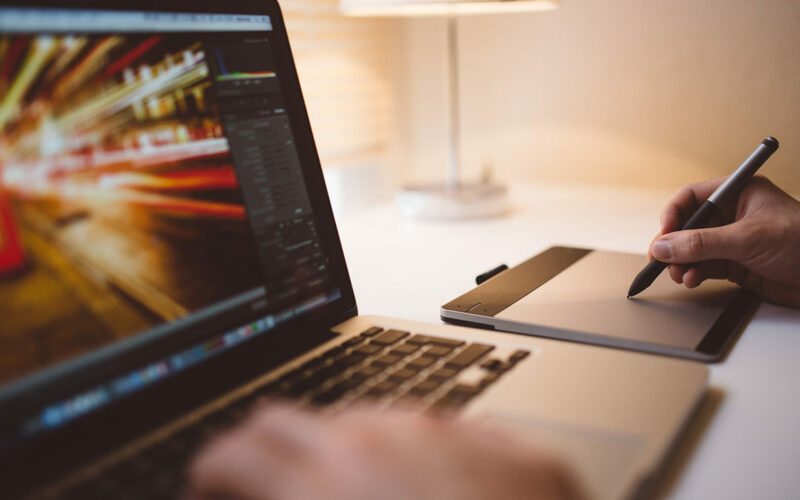 Freelancing is a great way to earn a living as it offers you the freedom to plan your work around your lifestyle and not your lifestyle around your work. If you do it right, Upwork can be a great source of continuous, dependable income. Have you had any success with Upwork? Got a tip that works? Do share with us in the comments. Very simple and easy way to understand the upwork process. Can you explain tips on cover letter? Happy to hear you found it useful, Shankar. We’re working on another post on Upwork Proposals which will have some advice on cover letters so be sure to come back and check out soon. All tips are really helpful but please tell me how to turn YES to rising talent. I am working on Upwork but whenever I apply for a job it has a red mark on rising talent. This is all very interesting if I was looking for a position as an employee with Upwork, BUT I AM LOOKING TO HIRE A CERTAIN PERSON TO HELP ME WITH MY EXISTING WEBSITE!! How do I get to that information? I am really not interested in becoming a Nomad or writing a blog about my travels. Hi, due to my past mistakes, my JSS fell down to 72% and now I am unable to get any jobs to fix this. How can I improve this score now? Please help. Hi Anshul, yes that’s a common occurrence. What you need to do is keep following the tips we’ve discussed and within a couple of weeks your JSS should start rising again. Remember it takes a few weeks for the JSS to change regardless of the jobs and feedback you get so give it time.